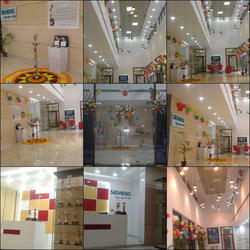 We have done Siemens Kolkata Reception Work. Success never comes on its own but through continuous diligent efforts of thepeople in completing every assigned mission beyond excellence. This lineapplies to every single industry in any part of the world. Eyeing on becoming an industry leader with strong global presence andrecognition. We excel in various project types, be it the interior design forhome or office or corporate. The exceptional performance of Interiors & exteriors throughout the yearshas enabled us to gain some of the appraisals in the industry. 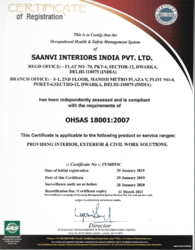 For instance,Saanvi interiors had simultaneously worked on various projects and indifferent cities within the committed time duration and quality work. 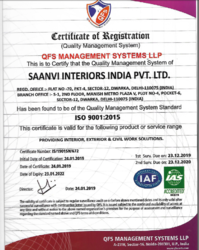 As eyeing on being master interior design company, Saanvi Interior neversettles for the skills and ideas that it posses. The professional interiordesign consultants instead are constantly seeking for improvement with acommon goal to better serve our clients. Certified for the Quality Management Standard Systems. Certified for the service ranges and providing interior, exterior and civil work solutions.